I have pretty much cased Natasha's card because the moment I saw it I thought of that gorgeous circles paper in the Sweet Pea designer series stack. I punched the circles out of the paper overlapping where I needed to (because not all of them were full circles). I adhered some of the circles to my Kraft layer, added the others on dimensionals and completed the layer with a sentiment from Trendy Trees. The Kraft layer is matted onto Pumpkin Pie card stock then adhered to a Whisper White card base made from folded A5. I'm still on my thank you card mission and this card can serve as a huge thank you to Natasha for her brilliant sketches week after week. I love the sketches and think you're amazing Natasha! We have a birthday party this weekend - woohoo! Hope you have lovely things lined up too. 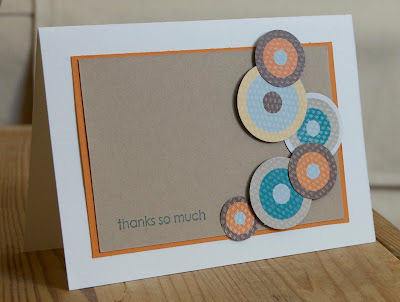 I love the colours you used and all the layering of the different circles. It's very effective. 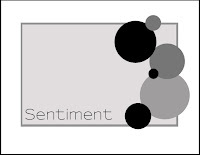 I would also like to thank you for leaving a comment on my blog. Love your card - these papers are the perfect fit for this sketch. Wow! This is fabulous! What an awesome use for that Sweet Pea paper! That's a great card, and hey, perfect for any boys in your life! Great use of the dsp. Such a fun card. Love the take on the great sketch. Such a good idea to use the circles on the patterned paper for this card. And I agree that Natasha is fabulous -- as you know, I love her sketches, too!